In modern days everything is a service. You create documents, upload photos, deploy computers, but what’s happening to your trash? 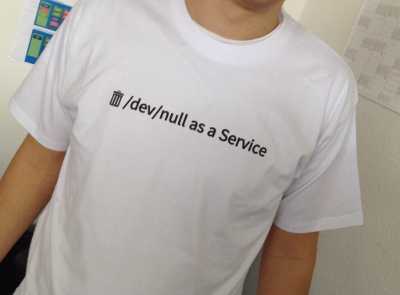 That’s why we’re launching /dev/null to the cloud. IAAS, SAAS, PAAS, holy fuckshit, we call our baby DAAS. Don’t get rid of your data yourself anymore. Use our distributed service located in over 380 countries! No matter if you’re using it personally or for your business: plans for whole companies are available as well. Just because, of course, everything should be a managed-service somewhere in the internet! We’re a young and dynamic team of messy data-scientists who have failed at being employed on the real market. Our experience in losing data and throwing files away is more than amazing! Over the years, we have managed to get rid of so much important data at home and even at work. Pictures of our holidays, important invoices, login details… it’s all gone. So we started to make a business out of what we’re good at. EPS files for making your own T-Shirt now available here: Black, White. Now with Discard protocol support! See Code for details. Corporate identity. We’re now having some shirts!